Plaid Patent Approved: Goodbye, Roy G Biv! Abq Jew sheepishly announces another way to tell that Pesach is coming: the Purim issue of the Forward arrives in the mail. This year's Backward (as the Purim section is called) includes the title article, provided by Abq Jew in its entirety, with the understanding that you will click here to read the other Purim pieces; these range from the mildly amusing to the truly hilarious. 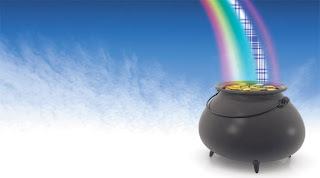 Organic food stores, children’s book publishers, LGBT groups and leprechauns have been thrown into turmoil by the discovery by Noah Obadiah, a professor at the Technion in Haifa, of an extra color in the rainbow. Although he discovered the color nestling between blue and indigo several months ago, he was waiting for the patent application to be accepted before announcing the news publicly. Long believed to consist of only red, orange, yellow, green, blue, indigo and violet, the visible rainbow has been revealed to contain an aesthetically pleasing blue-and-white plaid that Obadiah has named Rebekkah after his daughter.